Your sides are going to hurt and your cheeks will be so sore after laughing and smiling for a solid ninety minutes! 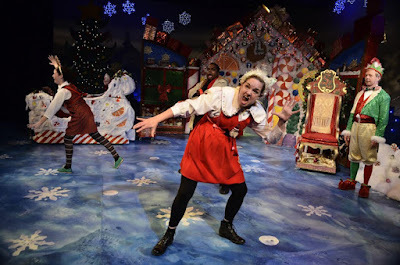 The Santaland Diaries at Horizon Theatre is one of the more fun shows I've seen in a long time...and one that, delightfully so during the holiday season, perfectly balances measures of naughty and nice. Last year I got an awesome photo with Santa Claus (think Vulcan Salute), but I think Barry beat me out this year. Crumpet the elf commandeered Barry during our photo-op, a memory Barry won't soon forget, mostly because it was such great fun. All theater-goers are invited to make photos with the cast immediately following the show! I recommend dressing festively and NOT wearing a brown sports coat...what was I thinking! In my defense, I came straight from the office. I'll plan something more holiday-appropriate next year. 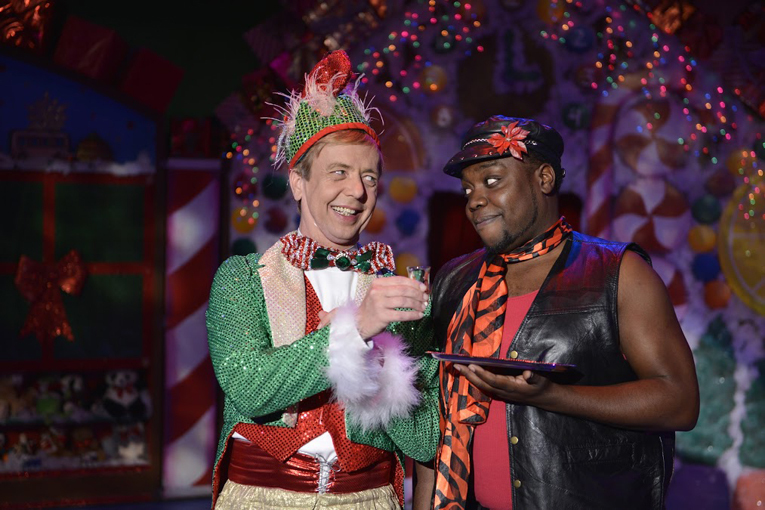 Harold M. Leaver has played Crumpet for 17 years, but he's so much more than an elf! This amazing actor holds degrees from Rhodes College and University of Georgia...AND he is a co-founder of Actor's Express! 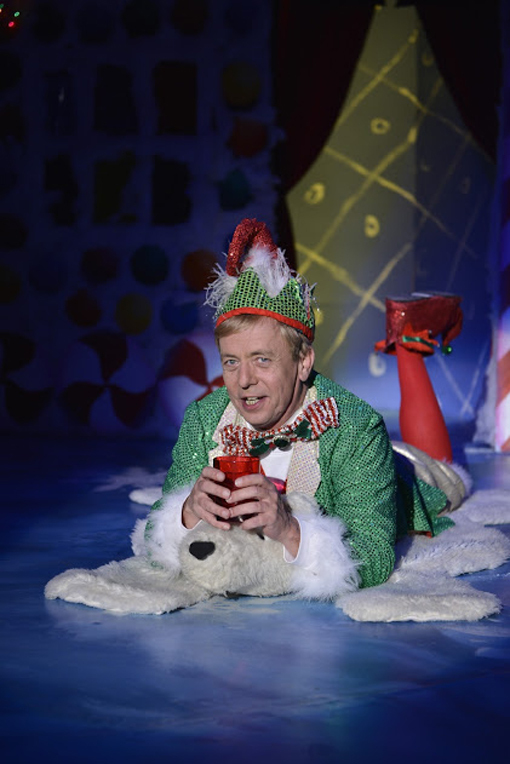 His resume goes on and on, but what you need to know when going in to see The Santaland Diaries is that Leaver is going to make you laugh til it hurts! Lala Cochran plays "sidekick" in The Santaland Diaries. I'm not certain, but I believe they use "sidekick" because the program would be a book if it listed ALL the characters in this show! 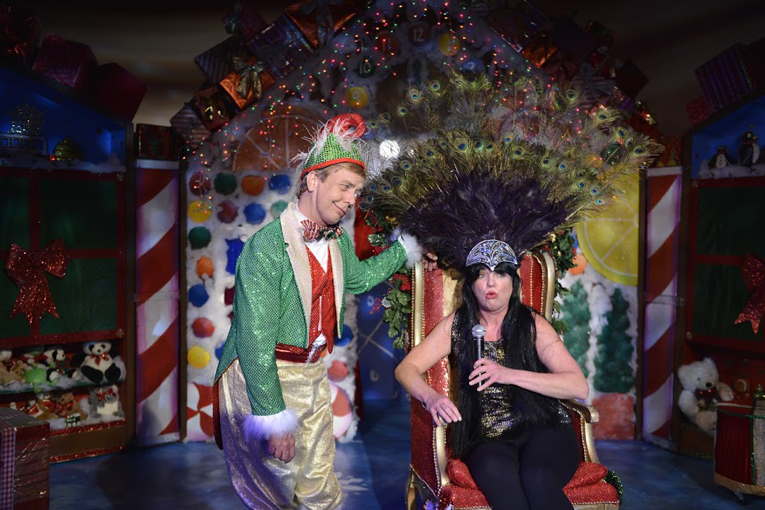 Both sidekicks perform an incredible number of characters and celebrities, including Cher! Having seen Lala Cochran in a number of plays over the last couple of years, I've become a huge fan. She's brilliant! And she's fun. Although The Santaland Diaries had been on my "to see" list for a number of years, it was at Lala's mentioning that she would be in this run that prompted my action to finally get tickets. Enoch King, who also plays "sidekick" in The Santaland Diaries, is a riot and delivers punch line after punch line, many of them in for form of facial expressions. This is a fast-paced, quick-witted play with lots of simultaneously delivered, hilarious actions and lines. Some of the humor is subtle, but most of it is in-your-face obvious, all of it hilarious. 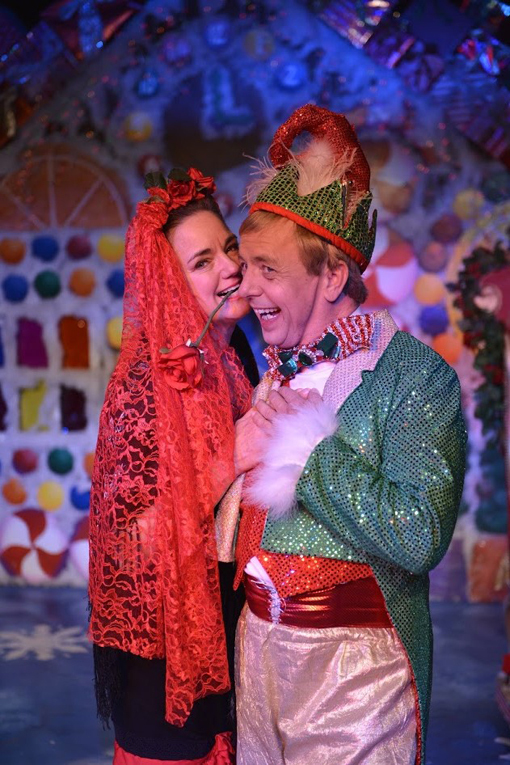 Other elf appearances are made by Horizon Theatre Apprentice Company members Nick Suwalski and Jasmine Thomas. You're going to be blown away by the number of characters and number of costume changes in this show...it's a whirlwind of a performance! 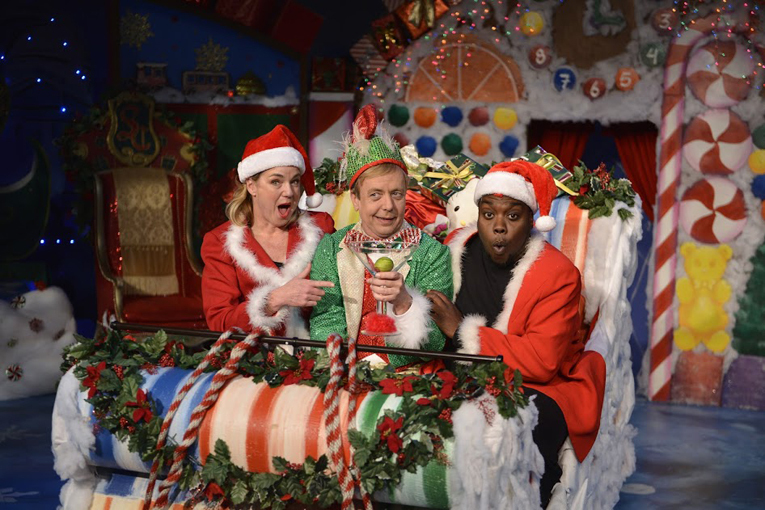 Then National Public Radio (NPR) producer Ira Glass bought David Sedaris, playwright of The Santaland Diaries, to the airwaves of NPR's Morning Edition in 1992. I just listened to their 2015 traditional recording. 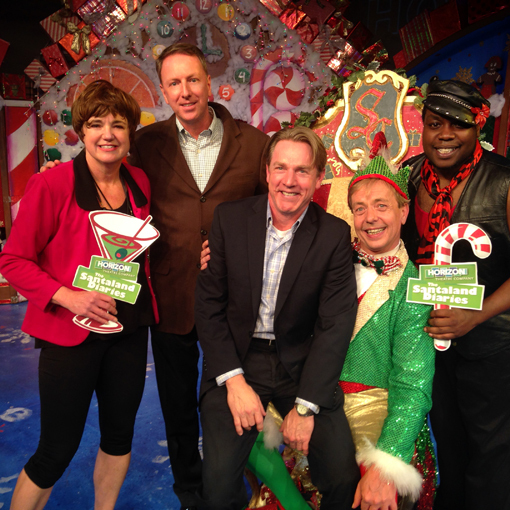 It made me want to go see The Santaland Diaries at Horizon again! 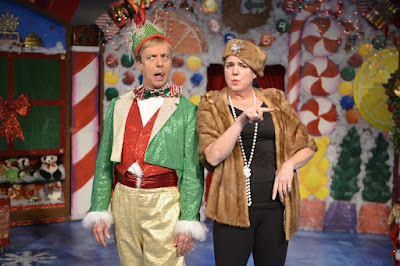 This year marks the 17th year that The Santaland Diaries has gleefully entertained audiences at Horizon Theatre. After the show I heard quite a few audience members comment that they had seen the show multiple years, and I totally get it. I will definitely see this one again and again, year after year. 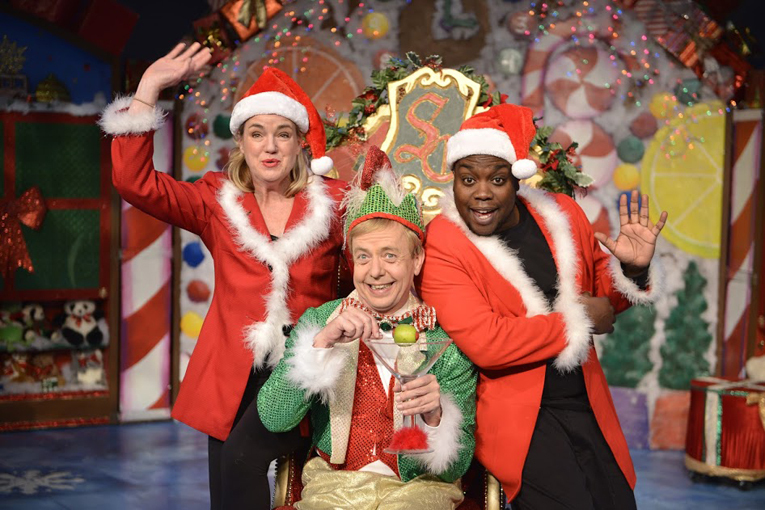 Jeff Adler, whom I've not yet had the pleasure of formally meeting, is the returning director of The Santaland Diaries. While I may not have met Jeff yet, anytime I see his or his wife's name—Lisa Adler, who I have had the pleasure of meeting—attached to a production at Horizon Theatre, I know without a doubt that it's going to be magnificent. 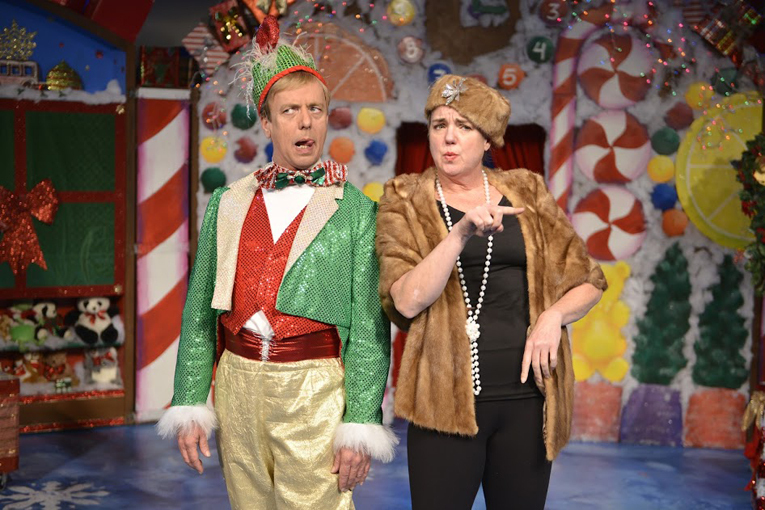 Jeff and Lisa are the Co-Founders and Co-Artistic Directors of Horizon Theatre and the multitude of spectacular plays and performances—since 1983—are testaments to just how brilliant they are! 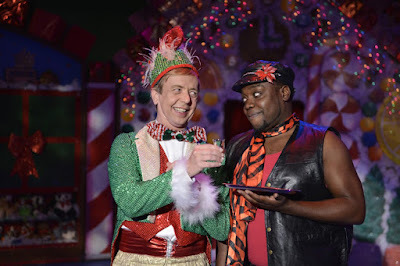 Everyone who attended The Santaland Diaries the night we did will not soon forget Chris, the audience member that Crumpet pulled from his front row seat to participate in the play. I'll leave it at Crumpet has a naughty side—you'll have to witness this fun for yourselves. And Chris' girlfriend was not exempt to the merriment of Crumpet-initiated spontaneous audience involvement. She and Chris, along with a few others incorporated into the spontaneity, were great sports! I haven't mentioned this, but The Santaland Diaries is based on a true story! It recounts the true-life tale of an out-of-work writer's stint as a Macy's Department Store elf. Believe me, you'll be able to relate to much of what is told in this hilarious story! Remember to stretch your tummy and mouth muscles before the show. 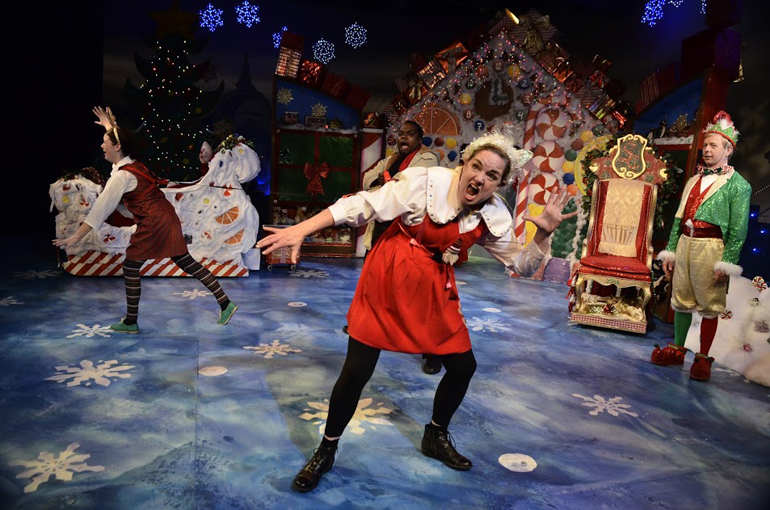 But even if you do stretch, you're going to laugh until it hurts, so just plan on that, and get your tickets to see The Santaland Diaries at Horizon Theatre before it closes on Thursday, December 31. "Thank you!" to the cast for the all the naughty, all the nice, and especially for gifting us an abundance of festivity and hearty laughs!